Advertising and graphic design agency; advertising and graphic design services for third-party goods and services; advertising and promotional graphic design; creation and launch of advertising and promotional campaigns for third parties; establishment of communication strategies, internal and external business communication auditing service; management services and coordination of communications with the media; public relations services. Website design service; establishment of web marketing strategies for third parties; web application development. VOYOU conducts its business in compliance with the highest ethical and integrity standards. Due to the nature of its activities, VOYOU has confidential information on its customers and its employees. Faced with the development of new communication tools, VOYOU pays particular attention to the protection of privacy. That's why VOYOU has established procedures that respect the confidentiality of personal information it collects. Any identification information about an individual is deemed personal information. Therefore, your full name, postal code and email address are considered personal information. 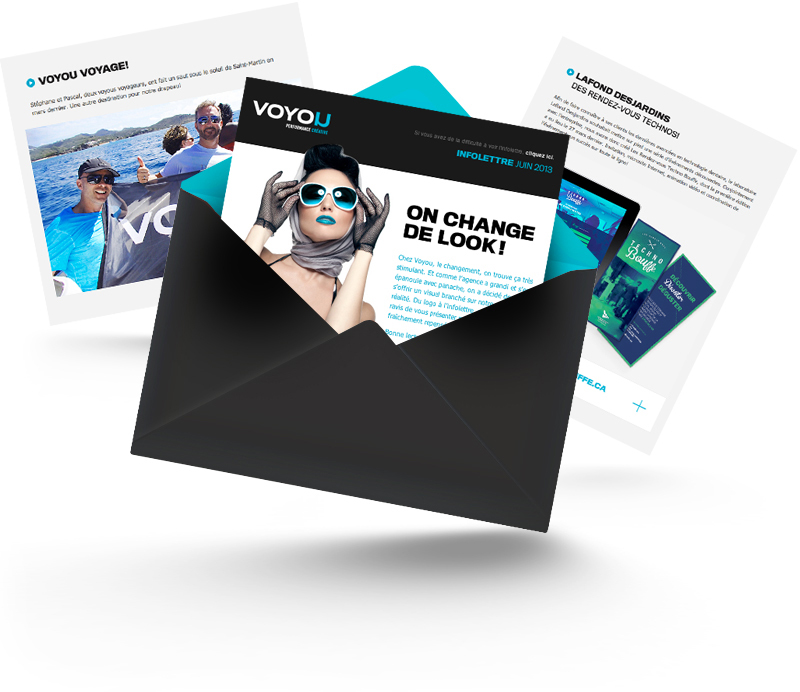 Personal information collected by VOYOU comes from forms and the interactivity between you and our website. VOYOU also use, as shown in the following section, cookies and/or logs to collect information about you. If you do not want your personal information disclosed to third parties, you can prevent the disclosure of this information at the time of collection or anytime afterward as described in the "Withdrawal and Veto Rights" section. VOYOU collects and uses only the information for the purposes identified above. Employees use only the personal information they need to perform their duties. VOYOU offers personal information withdrawal and veto rights. The right of veto is defined as an option for online visitors to prevent their personal information from being used for certain purposes, as outlined during collection. The right of withdrawal is defined as the possibility for users to request that their personal information not contained, for example, in a mailing list. Google also offers you the possibility to automatically unsubscribe from any advertising targeted by their interests or "remarketing." VOYOU recognizes the right to access and require rectification for individuals who wish to access, modify or delete information about themselves. The personal information VOYOU collects is kept in a secure environment. Every employee, consultant, director and officer of Voyou is obliged to respect the confidentiality of your information. VOYOU is committed to maintaining and developing the highest standards of confidentiality. This includes integrating the latest technological innovations designed to ensure the confidentiality of your personal information. However, since no system offers total security, a certain risk is always present when the Internet is used to transmit personal information.